Estuaries are partially enclosed bodies of water that occur where the land meets the ocean. The world's largest estuaries are at the ocean ends of rivers that deliver freshwater from surrounding and sometimes remote upland areas. Estuaries may be configured as sounds, bays, lagoons, or networks of tidal creeks and marshes. Many estuaries are separated from the ocean by barrier islands and do not have major sources of freshwater inflow. Estuaries are more common on coasts with wide and shallow continental shelves than on coasts close to tectonic plate boundaries. Estuaries are physically and chemically dynamic and complex ecosystems . Annual, seasonal, and daily fluctuations in freshwater input, tidal inundation, temperature, wind, and other hydrological and meteorological factors are responsible for the highly changeable character of estuaries. Due to variations in tidal height, currents, wave exposure, sediment types, salinity, and depth within estuaries, many different types of submerged and intertidal habitats exist. The diversity and interrelatedness of habitats contributes to the biological richness of estuaries. Temperate and tropical estuaries are among the most biologically productive ecosystems on Earth. Salt marshes dominated by Spartina grasses can produce 5 to 10 tons of organic matter per acre per year, which is more than most agricultural crops. In tropical estuaries, mangroves are the dominant producers. Submerged seagrass beds, macroalgae ("seaweeds"), and phytoplankton also produce organic material that supports abundant and diverse populations of animals. Direct consumption of estuarine plants is important, but many small estuarine animals process decomposing plant material and associated microbes known as detritus. Rich populations of invertebrates living in the sediments and water provide food for shrimps, crabs, fishes, birds, and mammals. 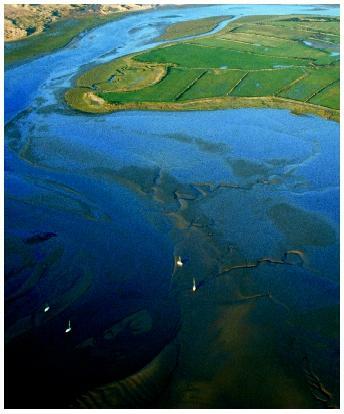 An aerial view of the sandy Ravenglass Estuary in Cumbria, England. to complete their life cycles. Adult fish, marine mammal, and bird migrations are often timed to coincide with best conditions for reproduction and feeding in estuaries. Coastal areas, especially estuaries, have always attracted and supported human populations. About 40 percent of the world's population lives within 60 miles of the coast, and 22 of the 32 largest cities are located on estuaries. Human impacts associated with agricultural, industrial, and residential development in coastal watersheds have resulted in changes in freshwater inflow, increases in nutrients, and the destruction of wetlands. Dredging, diversion, and damming have also altered estuarine habitats. Reductions in water and habitat quality and overharvesting have reduced resources and changed biological communities. Healthy estuaries help to regulate flooding and decompose contaminants. Increasing awareness of impacts and advances in scientific knowledge and technology have led to some success in reducing impacts and restoring water quality. Education and long-term planning are keys to achieving a balance between sustaining economies and preserving the ecological integrity of estuaries. Day, John W., Jr., Charles A. S. Hall, W. Michael Kemp, and Alejandro Yanez-Arancibia. Estuarine Ecology. New York: John Wiley & Sons, 1989. Teal, John, and Mildred Teal. Life and Death of the Salt Marsh. New York: Ballantine Books, 1969.